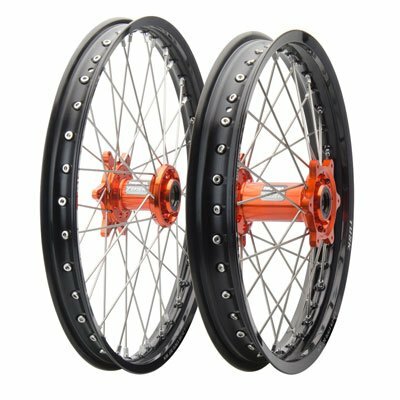 KTM 200 250 300 350 SX XC EXC MXC SX-F XC-W XCF-W Tusk IMPACT Complete Front/Rear Wheel Kit 21''/18'' Black Rim/Silver Spoke/Orange Hub by Tusk at Kart Racing Network. MPN: 1231447520008. Hurry! Limited time offer. Offer valid only while supplies last. Wheel kit includes one complete front wheel and one complete rear wheel. Performance wheel assembly for motocross and off-road racing applications. Wheel kit includes one complete front wheel and one complete rear wheel. Performance wheel assembly for motocross and off-road racing applications. Pre-assembled wheel is complete with rim, spokes, hub, bearings, seals, and spacers. Anodized rim is constructed from 7050 T-6 aluminum to be the strongest in the market. Hub is forged (not cast) from 6061 T-6 aluminum and CNC machined for precision fit, increased strength, maximum weight savings, and a factory look. Spokes are made from quality 304 stainless steel. Wheel assembly is complete with high-quality sealed bearings, seals, and hard anodized wheel spacers. "The wheels were amazingly good. This is the motocross wheel value of the century." - Motocross Action Magazine.